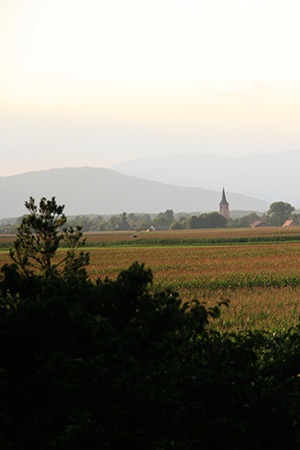 The villa is located in Marckolsheim, Alsace, France approximately 10min by car from the German border. It is an excellent and practical base for your Alsace vacation, a short distance to the Vosges mountains, the Black Forest in Germany and even the Basel region of Switzerland. The local climate is very warm and dry which promises many sunny days. Marckolsheim is a small and lively town with 4.000 inhabitants and contains all essential services (local restaurants, tourist office, bank/ ATMs, post office, large well-equipped supermarkets, hotels, car garages or bike repair shops). The world famous Auberge de l’Ill (www.auberge-de-l-ill.com) is located two villages away from Marckolsheim (7min drive). Hotel de l’Illwald (www.illwald.fr/de/index.php) offers excellent Alsacian food in an old monastery between Marckolsheim and Sélestat (10min drive). Explore the world famous Route du Vin (www.alsace-wine-route.com/en) along the foothills of the Vosges, offering breathtaking views across the valley, the famous vinyards, towns and castles. In a 15min drive from Marckolsheim you are in the centre of ancient Ribeauville and only a further 10min away from historic jewels like Riquewhir or Kaiserberg. Wine festivals take place frequently from April till October and wine can be tasted and bought directly from the uncountable wineries in villages and small towns throughout the year. Explore the historic Rhine forests by foot, bike or canoe. Within 10min drive you are in the middle of unspoiled lush forests around ancient side rivers of the Rhine and a unique ecosystem. The Illwald between Marckolsheim and Sélestat (D424) is one of France’s national nature reserve (www.reserves-naturelles.org/ried-de-l-ill-wald). Wildlife includes beavers, cranes or plenty of Storks, the iconic bird of Alsace. Canoes can be rented Moulin de la chapelle, Sélestat (off theD424). Book in advance +33 (0) 683785943(www.itinerairalsace.com). Beautiful country walks and cycle rides can also start directly from the house. The house is located 3min away from the historic Rhine-Rhone canal, which has recently been restored for tourism. Marckolsheim is ideally located to explore some of central Europe’s most beautiful and historic towns located in the border region of France, Germany and Switzerland, such as Sélestat (10min drive), Colmar (20min), Freiburg (30min), Strasbourg (35min drive), or Basel (45min). Sites and attractions are too numerous to list here – both historic and contemporary. Visit the three nearby UNESCO World Heritage sites: Strasbourg with its world famous Cathedral and the Humanist Library in Sélestat (UNESCO‘s Memory of the World Register). The third unmissable site is the medieval Isenheim Altarpiece by Mathias Grünewald located in Colmar’s famous Unterlinden museum. Throughout the year the Vosges mountains offer fantastic outdoor activities ranging from hiking to skiing. On the German side of the Rhine, the Black Forest offers equally beautiful nature experiences as well as numerous hot springs. Only a 10min drive into Germany is the picturesque hills of Kaiserstuhl, volcanic mountains famous for wines, fruits, beech forests and historic villages. A major international attraction is the vast fun park Europapark – a mere 30min drive away (www.europapark.de/lang-en).